With more than 120 million users in more than 200 countries (including at least a million lawyers) and web traffic that ranks it as the 13th most visited site on the planet, LinkedIn is the social networking tool of choice for professionals. It is far more than a glorified way for job hunters to put their CV online. LinkedIn profiles are optimized to perform well in search engines, specifically when someone looks for you by name. In fact, it’s not uncommon for a LinkedIn profile to rank above your firm’s website! Don’t list every job you ever had: Some of you were lucky enough to have really interesting, exciting or unusual summer jobs. Good for you, but will it really impress the firm where you want a job (or a potential client when you are a lawyer)? In many cases, probably not. Include a reasonable level of detail about professional work and industry experience post law school. anything before that is probably irrelevant. Do list other relevant or interesting background: You should include other relevant background information in your profile. The LI profile page outlines what you should include. Give details about your college or university degrees; affiliations, articles or books you have written; awards you have won; books you are reading and so on. Note that you can change the order of the sections on the profiles page– put the sections that highlight your strengths at the top of your profile. Don’t use formal and dry CV-speak: Inject a little personality. Craft something that is client focused. ask yourself what prospective clients really want to learn about you. Make an educated guess as to the words prospective clients might search to find you and sprinkle these keywords through your profile. Do make your profile public: While your LI contacts will always see your full profile, LI allows you to selectively hide details of your profile from other LI users on the Privacy & Settings page. This defeats the purpose of being on LI. Most of you should share all or most of your profile with everyone. Do create a LI vanity URL: By default, your LI URL will be alpha-numeric gibberish. A LI URL that includes your name is far more friendly. You can personalize your LI URL by clicking Privacy & Settings > Privacy > Edit your public profile. I suggest you use the following: linkedin.com/in/FirstNameLastName. Collecting a network of contacts is the very essence of LI. Here are some tips for build­ing a good collection of LI contacts. Do consider the quality, not the quantity, of your LI contacts: We all want to be popular but ultimately, the quality of your contacts is more important than the quantity. While a high number of LI contacts may look impressive at first, potential clients will dig deeper and judge you by the details in your profile and the quality of the people in your network. Do make it easy for people to connect with you: LI allows you to limit invitations to connect to people in a contact list or people that already know your email address (Settings > Email Preferences). Don’t make it hard for people to connect with you. Configure LI so that anyone can send you an invitation to connect. Don’t accept LI connection requests from people you don’t like, respect or know: Politely say “no thanks” or just ignore the invite. This can be awkward, especially when people are pesky and keep extending invites to you. Protect your reputation by making sure you like and respect the people you connect with. Don’t accept connections from total strangers. Do be careful about conflicts of interest: If you are a litigator, be careful about connecting with the judges, experts or opposing counsel who might be involved with matters you are handling. while you may know them well, and may even be good friends with them, consider how having them listed as a LI contact might look to your client or the party on the other side of a matter. Ethics opinions say it is not proper for lawyers to become friends with someone to dig up information about them for use in a litigation matter. Do send personalized contact requests: Generic connection requests are cold and impersonal. Few things will make a stronger positive first impression than a personalized invitation to connect. This is especially helpful if the invitee may not be sure of or recall their connection to you. Do use the “People You May Know” feature: Look for this box under the person silhouette in the top right of your LI home­page. Click “People You May Know” to see a list of people LI thinks you might know. It generates this list by using keywords and by looking at the contacts of your contacts. It does a good job of finding people that you will know. Do right-click to open a new tab when extending LI connection invites: after you extend an invite to a new contact, LI gives you a list of other people you may know (it is the “People You May Know” list). what’s annoying is that clicking on “Connect” to add a new contact causes the list of suggested contacts to disappear or reset to the top. If you right-click on “Connect” and select “Open in new tab,” the invite will appear on a new tab and you still have the first tab with the list of suggested contacts you are working through. Do mine the contacts lists of people you know: Once you connect with someone in LI, you can see their list of contacts. As many of us work and socialize with the same smallish group of people, looking at the friends of your friends will help you find other people you know. The “Invite accepted” email is a great reminder to do this. Do use lists of other groups of people you know: I have had great success adding contacts by reviewing lists of names from some of the organizations I participate in (e.g. members of the Ontario Bar Association). This works well, as many LI users do not list the different groups they belong to or the activities they participate in. Do use the “Search” feature to find other contacts: Enter the names of companies or other entities where you know people to add people to your contacts list. Do remember to invite people you are connecting with in other social media channels to LI: While you will not want to add everyone you connect with in other social media tools, this will get you a few extra contacts. Do use the Search feature to find other contacts: Enter the names of companies, law associations or other entities where you know people to add people to your contacts list. Do remember to invite people you are connecting with in other social media channels to LI:while you will not want to add everyone you connect with in other social media tools, this will get you a few extra contacts. 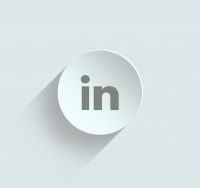 Do cross-market your LI presence: Let people know you are on LI by adding the LI logo or your LI URL to your email signature (make it a link), and anywhere else it will be visible to people that might want to connect with you. Most LI users are in a mad dash to collect contacts, and they are watching other LI users do the same thing. Unfortunately, they are missing out on one of the key benefits of LI: Being visible to your contacts by sharing information with them. Do post regular updates, but don’t overdo it. Do what is right and works for you. At the start, that might be one update a week. Over time it might grow to a single daily update or even three daily updates. Get on a regular schedule, and stick to it. Even better, post longer updates (click on “write an article”) as they get more exposure from LI. Do share interesting ideas, news, links or information: Strive to post updates your contacts will feel are worthy of reading. Send information that is practical, helpful, inter­esting or informative. On occasion, even funny things are fine. Don’t blast all your updates out at once: It’s great to be efficient and work on your updates at one time (e.g. first thing in the morning over your coffee), but remember that not everyone is online all the time. To give yourself greater visibility, use tools like HootSuite or TweetDeck, which allow you to schedule your LI updates for a later point in time. Do be professional: What goes around comes around, and it doesn’t matter if it’s in person, in print or online. Be professional at all times, because everyone is connected to everyone on the web. When using LI you must comply with your ethics rules at all times. Don’t use LI messages for lawyer/client communications:You can’t assume messages sent through LI are private. Don’t use it for lawyer/client communications. Do inject some personal info, but not too much: Social media connections are built on personal relationships. You need to share some personal information so your contacts can learn more about you. But always remember that LI is a professional network and most things that happen in Vegas, the bedroom or the kitchen are not appropriate for posting on LI. Don’t automatically blast all your other social media updates to your LI contacts: You can and should mention content that you post on your blog or in other social media channels, but don’t bore us all by blasting everything through LI. As a filter, note that you can configure your LI account to display only tweets with the #in or #li hashtags. As I stated above, posting regular updates is key to getting value from LI. But there are other simple things that you can do to give yourself greater visibility with your contacts. Do comment on the updates your contacts post: If you like, agree, or even disagree with something one of your contacts has posted, share your two cents by posting a comment on the original post. For reputation building, try to post comments on the updates of respected peers. Do ask questions: Web 2.0 is all about two-way communication and interactions. Asking a question in an update is a great way to engage your contacts in a discussion. And if you ask a question, make sure you read and comment on the answers! Do tweak your profile: By default, LI will automatically post an update every time you change your profile. You can turn this off, but I don’t think you should. Make it a habit of tweaking your profile once or twice a month. Do join a LI group: LI has a groups feature. Groups help people that are interested in a particular topic, entity or event find each other. There are also groups for events, associations and other entities. I guarantee there are groups on many topics relevant to your area of practice. Click on “Interests > Groups” and enter some keywords to search for groups that are of interest to you. But be warned: Some groups have far too many consultants and vendors aggressively marketing themselves. Do give and ask for recommendations: all of you will have asked for or given a personal or professional recommendation at some point (e.g. “Do you know a good mechanic? or “John is a good IP lawyer.”). A LI recommendation gives you or your contacts the ability to get or give a virtual recommendation that all your respective contacts can see. Just knowing someone is basic networking, but offering a recommendation takes it to a higher level. You should never give a LI recommendation unless you really feel good about someone and the work they do. Do look at and tweak your LI settings: I have mentioned the LI Settings and Profile configu­ration pages several times. Visit these pages and look at the various settings you can change. Most of you will want to go with the default settings, but you may find there are configuration options that will make LI operate in ways that are better suited to your personal preferences. Do create a LI Group: To show yourself as a thought leader, create your own group in an area that you want to build a profile in. You can draw positive attention to yourself by creating a group that will give you a profile in your area of expertise. Do work on your corporate LI page: If several people from the same law firm create LI profiles, LI will automatically create a corporate page for the firm. It aggregates the information from the individual profiles. The corporate LI page can be used to promote your firm and can be customized. Someone from your firm should be responsible for administering your firm’s LI company page. So there you have it: Some simple rules to govern your use of LinkedIn. Start building your LinkedIn network now. Not only might it help you find a job, it will be a useful professional networking tool for marketing when you become a lawyer. Dan Pinnington is Vice President, Claims Prevention and Stakeholder Relations at LawPRO.